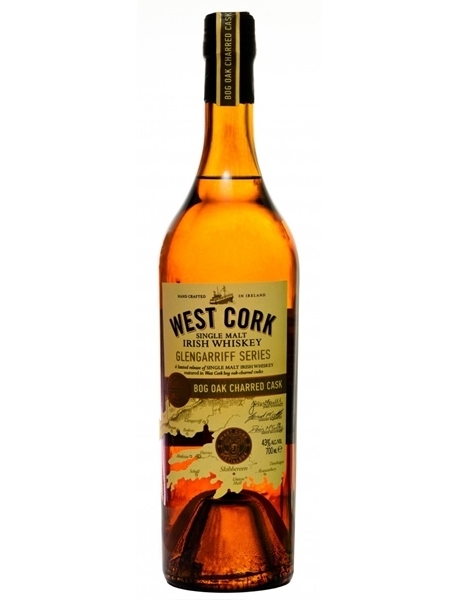 While West Cork Distillers Ltd was only formed in 2008, it was back in 2003 that it's founders - John O'Connell, Denis and Ger McCarthy - got started. Coming together with backgrounds in the Irish Food Industry and Commercial Fishing has proved to be a unique and innovative beginning for the Union Hall guys, now in production in Skibbereen in West Cork. So much of the equipment in their distillery has been fabricated by themselves, and while their beginnings were in brown spirits other than whiskey, whiskey now seems to be front and centre for West Cork Distillers. The distillery is now of age to be able to release their own distillate in the form of the Glengarriff Series, which is very exciting. Once again, innovation is to the fore. Instead of a straight forward single malt release they have concentrated on a finish with a twist. There are two single malts in the initial series, both matured in ex-Sherry butts. This particular one, the Bog Oak charred cask, has been finished in heavily charred virgin white oak casks where the charring has been fuelled by Bog Oak from West Cork's Glengarriff. It had been bottled at 43% ABV.